Born in Orange, Texas on December 29,1975, Timothy was the son of Dennis Hankins and Carolyn Reese Hankins. He was a 1994 graduate of West Orange Stark High School were he played football and was a member of Drama Club that won state level competitions his senior year. Timothy loved to play guitar and learn about his family history. He also had a love of the outdoors and was an avid hunter and fishermen. He had a lifelong dream of joining the United States Army, which fulfilled in 1995. He served in the United States Army for 19 years and in the Texas National Guard for 2 years. His tours of duty included Iraq, Afghanistan, Italy, England, Scotland, Haiti and others. 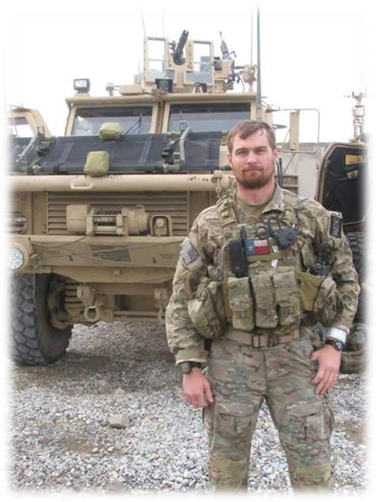 He served in the 82nd Airborne as a Jumpmaster and later became a member of the Green Beret as a Weapons Specialist. During his service he received multiple awards including 2 Bronze Star Medals, Purple Heart, 6 Army Commendation Medals, 8 Army Achievement Medals, 6 Army good conduct Medals, National Defense Service Medal with the Bronze Service Star, 4 Afghanistan Campaign Medals with Bronze Service Star, 3 Iraq Campaign Medals with Bronze Service Star, Global War on Terrorism Expeditionary Medal, Global War on Terrorism Service Medal, Armed Forces Service Medal, Humanitarian Service Medal, 3 Noncommissioned Officers Professional Deployment Ribbons, Army Service Ribbon, 2 Overseas Service Ribbon, NATO Medal, Multinational Force and Observers Medal, Right Side Award, Presidential Unit Citation (Army and Air Force), Meritorious Unit Commendation (Army), Army Superior Unit Award, Combat Infantryman Badge, Expert Infantryman Badge, Master Parachutist Badge, Basic Parachutist Badge, Badge Combat and Special Skill Badge Marksmanship Qual Badge, Expert, Bar, Weapon: Rifle, Special Forces Tab, and 6 Overseas Service Bars. Timothy was an accomplished, outgoing, kind man with such a big heart. He served his country with pride and will be greatly missed by anyone who knew and loved him. He was preceded in death by his grandparents, Leslie and Fleta Reese; and his, John Howard Hankins. Those left to cherish his memory include his wife, Casey Hankins; his parents; grandmother, Betty Rollings; son, Timothy John Hankins ll and Reese Dillon Hankins; aunt and uncle, Sharon Hankins, David Veiseh and Penny Hankins, and Betty Reese; cousins, Cynthia Mouton, Kimberly Duncan, Robert Reese, Katie King, Kara Hankins, Ed Veiseh, and Greg Veiseh.